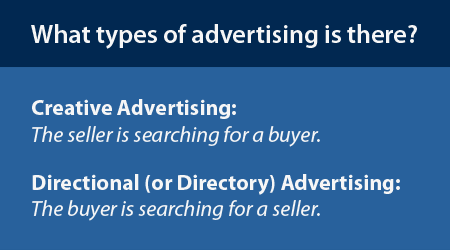 Types Of Advertising And Why Advertising Is Important. San Diego, California, USA: Advertising is a vital part of the marketing communications plan for small, medium and large companies to gain sales, increase your market visibility, branding purposes and to stay competitive. Author Jeffrey I. Richards once said that "creative with strategy, is called 'advertising'." The companies who advertise are the ones who let their buyers know they want to earn their business. 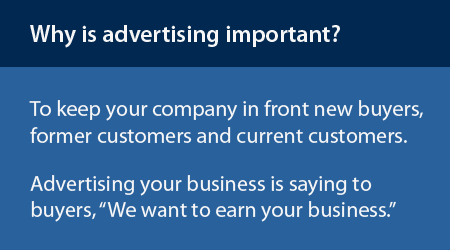 In addition, advertising allows companies to gain new customers, and also to help to bring back former customers and remind current customers to place their orders. When advertising online, it helps your company to be visible to buyers who are based locally, regionally, nationally or internationally. There are many ways to advertise today in the helicopter industry: There are trade shows (and trade show give-aways), industry magazines, mailers (can include coupons), flyers, email blasts, company websites, business cards, word-of-mouth (referrals), direct sales, press releases, articles about your company, blog articles, custom printed business apparel & products, social media and online directories, like Helicopter Links, to name a few. Trade shows are valuable because potential customers and current customers can see products close up and/or talk to company employees and discuss the products. The detraction of trade shows is the expensive price tag for both attendees and exhibitors, and in addition, the majority of attendees of a trade shows are typically only from a regional or national audience. In fact, there are many people who can't attend trade shows due to the cost, bad timing due to business or personal commitments or lack of interest in the trade show. 1) Magazines talk about readership numbers. That's because people are picking up the magazine to read the articles! Believe it or not, not all people, at the time they are reading a magazine, are ready to buy and are not looking at the advertising. The horror! 2) When a buyer does need to buy, do you think they look in their stack of helicopter magazines and start flipping through the pages to find an advertisement? If a reader sort-of remembers an advertisement, what's the chance a reader will remember which issue the ad was in? Which magazine did I see the ad? What page was that ad? 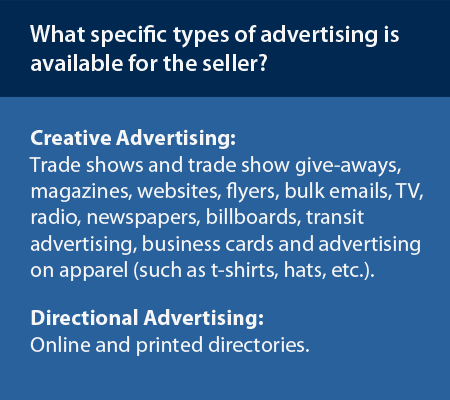 3) Magazine advertising is typically an expensive proposition for the seller. Email blasts are useful when people open them. The industry standard for a good open rate on email blasts averages around a 20%. We also know that even if a person does not open your email blast, and if your company name is in the "From Field" for your outgoing email, it does keep your company name in front of your customers. Therefore, sending an email without the user opening it, helps to keep your company name in front of the customer. One of the detractions of email blasts is trying to gain a legal email list. Who wants to join yet another email list? Legally, professionally and ethically, a company should only email to those on their email list to people who have opted into the email list. If a company purchases an email list or adds people to their company's email list without their permission, this is quite illegal in the United States per the CAN-SPAM Act of 2003. Companies with a big enough bank account can hire professional writers for their press releases, articles and blog articles. Sending a press release is not as easy as jotting down some notes about your company. A good press release follows a strict AP Standards format and is written by a professional writer. If you can get a writer from a helicopter magazine or from Helicopter Links to write an article about your company, then this is a great way to get some good exposure in the helicopter industry. If you have a blog for your company, this is great way to write about your products, services, customer service, your employees and anything else you want to write about your company. You can write on a variety of topics on your own blog. Direct mail is a good way to keep your company's name in front of new and current customers. However, there is the cost of graphic design, printing, the stuffing and labeling envelopes, the cost of keeping a data base and the cost of the postage! And not every company can afford direct mail to national or international addresses. Flyers and business cards that have the best look, are typically created by a graphic designer. A graphic designer also is responsible for designing the business cards for your company. Websites today are somewhat different than they were 10 years ago. Today, more people are using mobile devices to look at websites. Websites which change their size based on the size of the device the user is using (for example, a desktop has large screens, a tablet has a smaller screen and mobile phones have smaller screens), is called responsive web design. Having a good web designer and a graphic designer is a key to having a good and up-to-date website. A word of caution, there are many new websites which are lacking key information about things such as the purpose of a company, product information, history of the company, key employees of the company, it's full email address, phone numbers and email addresses. If your company sells products, it is highly recommended that you figure out how to sell your items online. This way, your current customers and new customers can easily purchase your products. While there are probably many different types of technology you can use your company website, I would always recommend to have Google Analytics on your site. Google Analytics, sometime called the gold standard of web statistics, if free to use by medium to smaller companies and is one of the best web statistics programs available. Larger corporations with lots of traffic will need to pay for Google Analytics. If you are selling custom business apparel with your company name and logo on it (such as t-shirts, jackets, hats, coffee mugs, key chains), this is yet another way to make some money and have your employees and customers pay for and do the advertising for you! Social media is a good way to keep your name in front of customers because it's a free service (unless you decide to advertise with the social media company). The only drawback with social media is you need to have enough followers to see results and you must have a staff (which takes the labor hours and a strategy, if you really want to make good use of your social posts), for your company. Remember to post all your press releases, articles and blog articles on your social media. What I recommend, is that the social media people keep a master list of all your press releases, articles and blog articles and every time you post an article, make a note in your master list of the day, month and year you posted the article. Then you can plan to repost all the articles and press releases which you like the best, every year (or every other year) or whenever you feel it's appropriate. Remember to take lots of picture of your products, office, plant, helicopter(s), employees, etc., and keep a master file organized by type of photo. Then every time you post a photo, you can find it, then remember to put the date (month and year) inside the file name of the photo. That way, two (2) months or two (2) years later, when you post the same photo, you know the last time you posted it social media. There is also TV, radio, local, national and international newspapers, aviation magazines (non-helicopter), billboards and transit advertising. I find that I've seen very little of this type of advertising for rotory-wing because the majority of their audiences are not in the helicopter industry. How does a company advertise to buyers who are searching for sellers? This is called Directional Advertising or Directory Advertising. Commonly known as the yellow pages or with the internet, it's called a directory. Companies can advertise anytime throughout the year on Helicopter Links website and potential buyers can view your ads, when they are in the buying process, at their convenience, year-round and worldwide. According to Google Analytics, about 80% of our visitors find Helicopter Links by using two (2) or more search terms in a search engine. That means that most of our visitors do not know Helicopter Links by memory. We are actually very glad about this because this means that Helicopter Links website is search engine optimized, meaning Helicopter Links is easy to find when buyers are searching for a seller in the helicopter industry. Our visitors use Helicopter Links for the same reason that people use Amazon or Ebay. People using Amazon or Ebay are researching before buying or they are ready to buy. With Helicopter Links, our visitors are doing the same, researching before buying or are ready to buy. Helicopter Links' website has also been built for ease of use for the visitor. All companies listed on our site have "text" listings which translate easily with our Google Translate button in the upper-right corner of every one of our webpages. We recognize there are about 196 countries in the world, which is why we use the Google Translate free service on our site. We also have an easy-to-use Site Map (just like the index pages of a printed yellow page book) to help our visitors find companies they are looking for. When people are searching online for products and services, they are on a mission. People on Helicopter Links website are doing the same. They are on a mission looking for businesses who want to earn their business. We offer one free listing to every helicopter related website around the world. Therefore, when a company advertises on Helicopter Links with banner ads, they typically get many more click-throughs on their ads than those companies with just one free listing. I hope this article helps you have a better understanding of advertising. And for those people who purchase advertising, we hope you'd like to call us and find out more about our advertising options and pricing. Please feel free to call or email us in the United States at +1 (858) 413-7074 or staff@helicopterlinks.com. Helicopter Links is located in San Diego, California, USA.